Thyroid cancer occurs when certain cells within the thyroid gland grow in an uncontrolled, abnormal, manner. The thyroid gland is a butterfly shaped gland located under the Adam’s apple in the front of the neck. The thyroid produces hormones that regulate heart rate, blood pressure, body temperature and weight. The patient had a FDG PET-CT (A-C) because there was a concern that the patient’s cancer did not show up well on the iodine-131 study as well as an MRI (D). 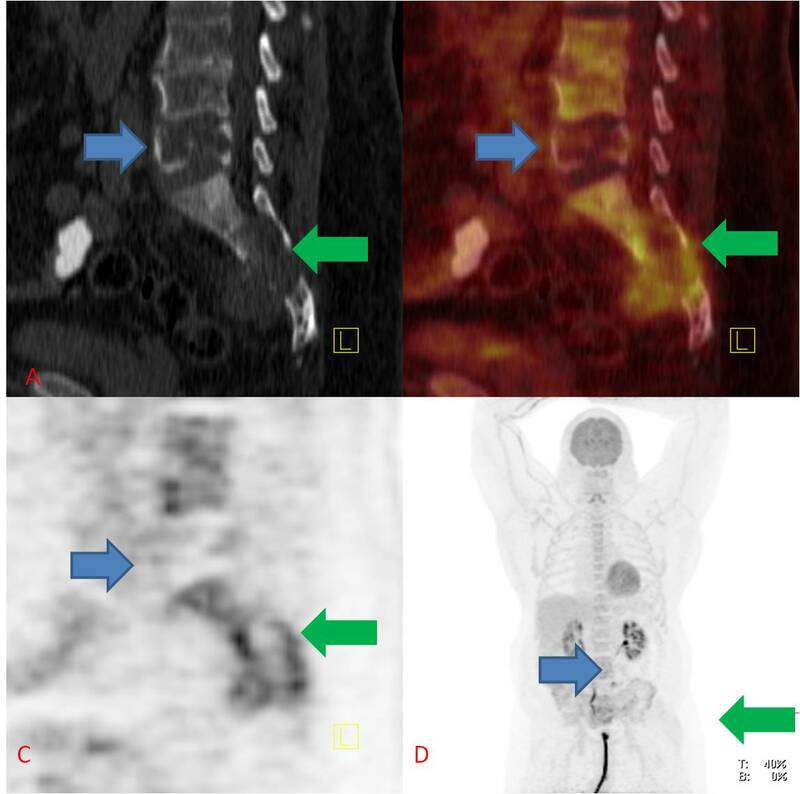 The cancer in the 5th lumbar vertebra (blue arrow) does not take up FDG very well and was better seen on the iodine-131 pictures. However, the cancer in the sacrum, known as the tailbone, (green arrow) does take up FDG fairly well but not very well on iodine-131 images. The difference in uptake between the two studies suggests that cancer in the sacrum is less like the original cancer in the thyroid and will grow more aggressively. Due to the size and location of the cancer in the bones, the patient will benefit from external beam radiation therapy given by a radiation oncologist followed by iodine-131 therapy prescribed by a nuclear medicine expert coordinated by his endocrinologist. According to estimates from the American Cancer Society, more than 48,000 new cases of thyroid cancer will be diagnosed and approximately 1,700 people will die from the disease in 2011. Papillary, which makes up about 80 percent of all thyroid cancer diagnoses. Follicular, which includes Hurthle cell cancer. Medullary, in which cancer develops in non-thyroid cells present in the thyroid gland. Anaplastic, which is rare and difficult to treat. Thyroid lymphoma, a rare cancer that begins in the immune system cells in the thyroid. Of these, papillary and follicular (including Hurthle cell) are classified as well-differentiated thyroid cancer. Developments in molecular imaging technologies are dramatically improving the ways in which thyroid cancers are diagnosed and treated. Research in molecular imaging is also contributing to our understanding of the disease and directing more effective care of patients with thyroid cancer. Molecular technologies used for thyroid cancer include radioactive iodine uptake imaging, radioactive iodine (I-131) therapy and positron emission tomography (PET) scanning. I-123-meta-iodobenzylguanidine (MIBG) scintigraphy is used on a limited basis to image and treat medullary thyroid cancer. How is radioiodine used in thyroid cancer? How is PET used for thyroid cancer? What are the advantages of PET for people with thyroid cancer? What is I-131 radiotherapy (RIT) and how is it performed? What are the advantages of I-131 radiotherapy for people with thyroid cancer? What is Iodine 123 meta-iodobenzylguanidine (MIBG) scintigraphy? ﻿How is radioiodine used in thyroid cancer? Diagnosis: as an aid in choosing a nodule to biopsy. Staging: a whole body iodine scan after treatment is very good at looking to see if the thyroid cancer has spread. Treatment: Iodine-131 has been used to treat differentiated thyroid cancer for over 60 years. Manage ongoing care: by detecting where the cancer has come back in patients with elevated levels of the protein thyroglobulin in the blood. ﻿What is a radioactive iodine uptake test? The radioactive iodine uptake test involves using a small amount of radioactive iodine and a gamma camera to detect cancer cells in the thyroid gland. 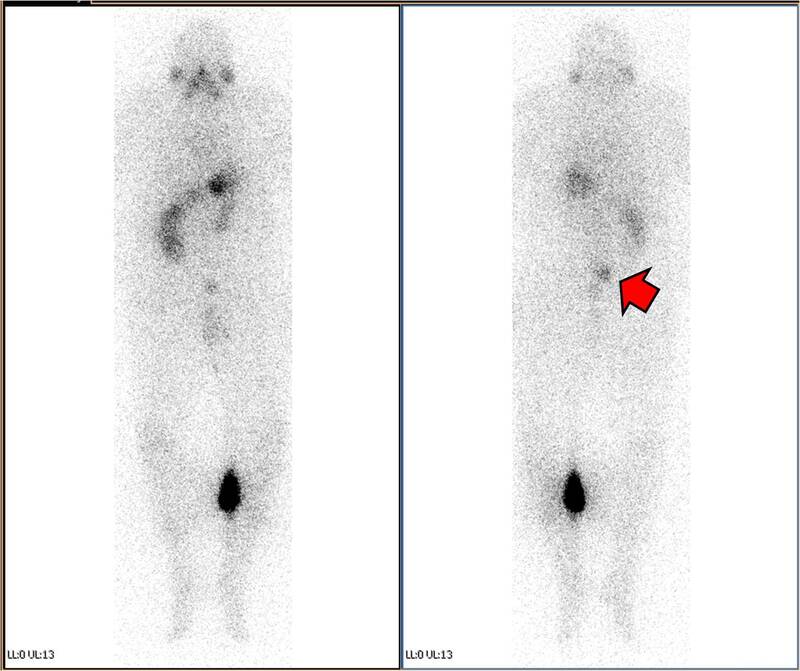 Whole body iodine-131 scan in a thyroid cancer patient with a very high thyroglobulin level which means the cancer has come back. The red arrow shows increased uptake (the dark spot) in a bone in the lower spine and less uptake in the bones of the mid-pelvis. The very dark area on the patient’s left leg is a urine bag. For the procedure, the patient swallows a capsule of I-123, which is absorbed by the thyroid gland. Using a gamma camera, the front of the patient’s neck (or the entire body for a whole-body scan) is imaged several hours later to determine where and how the radioactive iodine has accumulated. Thyroid cancer cells absorb more iodine than surrounding tissue. To detect thyroid cells located elsewhere in the body, the gamma camera will scan the entire body (called a whole-body scan). Radioiodine scans are also used in the care and management of patients with differentiated thyroid cancer, which includes papillary, follicular and Hurthle cell thyroid cancers. ﻿How is PET used for thyroid cancer? In patients whose thyroid cancer no longer concentrates iodine, FDG-PET can find where the cancer has spread. Staging: by telling where the cancer has spread. Manage ongoing care: by early detection of the cancer coming back. ﻿What are the advantages of PET for people with thyroid cancer? PET scanning is very useful as an alternative to radioiodine scans for patients whose thyroid cancer does not take up or absorb radioactive iodine. ﻿What is I-131 radiotherapy (RIT) and how is it performed? I-131 radiotherapy is a treatment for thyroid cancer that typically follows surgery to remove the thyroid. The treatment is used to destroy any remaining cancerous or healthy thyroid tissue after surgery. In I-131 radiotherapy, the radioactive material used is radioactive iodine I-131. The patient swallows the radioactive iodine in either liquid or pill form. The I-131 accumulates in and destroys both normal and cancerous thyroid cells. ﻿What are the advantages of I-131 high-dose radiotherapy for people with thyroid cancer? Because I-131 radiotherapy has improved the survival rate of patients with differentiated thyroid cancers that have spread to the neck or other areas, it is now the standard treatment for such cases. I-131 radiotherapy has limited benefit in patients with small differentiated thyroid cancers that are confined to the thyroid gland. ﻿What is I-123-meta-iodobenzylguanidine (MIBG) scintigraphy? I-123-MIBG scintigraphy is used on a limited basis to image and treat medullary thyroid cancer. The procedure involves the injection of the radiotracer I-123-MIBG into the patient’s bloodstream and imaging with a gamma camera or SPECT. Clinical trials are underway to evaluate the use of the radiopharmaceuticals yttrium-90 labeled octreotide and indium-111-octreotide to treat medullary thyroid cancer patients whose thyroid cancer has spread to other parts of the body and is not responsive to treatment with I-131 radiotherapy. Researchers are also evaluating I-124 PET to guide post-surgical treatment and radioiodine therapy in patients with differentiated thyroid carcinoma (DTC). Prior to radiotherapy, I-124 PET has also shown value for restaging disease, identifying patients most likely to benefit from radioiodine therapy and in determining safe and effective radioiodine treatments for individual patients.